Sophomores Vincent Kibunja and Chelsea Foster each posted personal-best times and top-100 finishes to cap their 2017 campaigns on Saturday, Nov. 18th at the NAIA Men’s and Women’s Cross Country National Championship at the Fort Vancouver National Historic Site. Kibunja’s national birth continued the program’s deeply-rooted success as the Monroe College transfer and Nakuru, Kenya native helped mark the seventh consecutive year a Maple Leaf man has reached the national stage. Kibunja did not disappoint. Kibunja ticked a second off his previous personal record set at the end of September in Louisville to finish in 26 minutes, 13 seconds, a time that placed him 96th overall of 326 total runner’s and 38.5 seconds better than his last time on a course just three weeks ago in the Crossroads League Championship. Kibunja finished with the second-fastest time of nine CL competitor’s behind Taylor’s Stephen Choo. Mark Shaw of Oklahoma City University took the top spot with a time of 24:09. The University of British Columbia took the team title in dominating fashion as they placed three runners in the top 10. 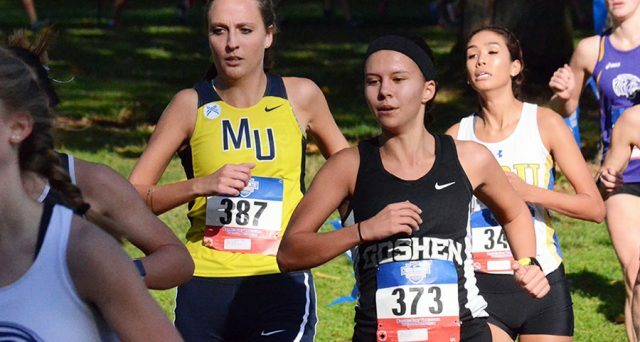 Following Kibunja and the men’s event, was Foster as the lone representative of the GC women’s cross country program. The Indianapolis product finished her five-kilometer trek in an even 19 minutes, shedding 4.4 seconds off her previous best set at the CL Championship. Foster’s race marks the ninth-fastest time in GC history and the first Maple Leaf woman since 2006 to post a time of 19 minutes or better. Her personal best was her fourth such occurrence this season. Kibunja and Foster’s trip to Vancouver, WA featured a brief stint Oregon to tour the runner’s paradise of the University of Oregon, in which they met former NCAA national champion and current professional long-distance runner, Edward Cheserk. The two also visited Pre’s Rock, the memorial of arguably the most decorated US long-distance runner, Steve Prefontaine. The national meet marked the conclusion of the 2017 cross country season, but Kibunja and Foster will look to carry their success to the track in just over a week at the Classic Products Warrior Invitational hosted by Indiana Tech University.